I call it my Ohana Flake Cake. This is a recipe I came up with about 4 years ago that always satiates my coconut cravings. Its a moist cake that I top with a tropical blend of fruits (fruit salsa). 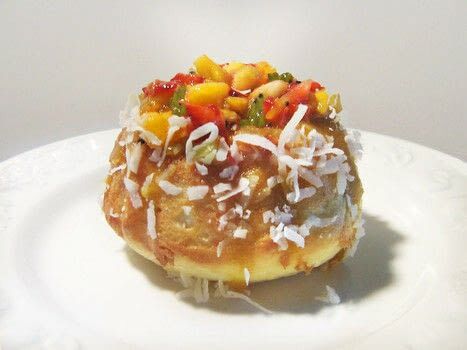 As you can see from the picture, my favorite way to make this cake is in mini-bundt cake form, and then I fill the hole to the top with the tropical fruit salsa. Enjoy the recipe! Combine the ingredients and m ix very well. Pour into a greased pan. If using a mini-bundt cake pan or silicone mold, bake at 325 degrees F for about 20-25 minutes. Keep an eye on it because different pans cook differently. You don’t want to overcook it. Once the center is set (doesn’t jiggle when you move it) and loses that glistening look on top, take it out. If using a a round or square pan, cook at 350 degrees F for 3o-35 minutes or until set. Once cool and removed from pan, top it with coconut flakes and tropical fruit salsa. The amount of mango, kiwi, and strawberry that you use depends on how you baked the cake. Just try to use equal amounts of all fruit. Chop it into little pieces or squares but not too finely. You want to be able to identify the fruit, not have it mushy. Mix the pieces together and add a small amount of sugar. Taste test to see if it is the desired sweetness (one of my favorite parts). Top the cake!